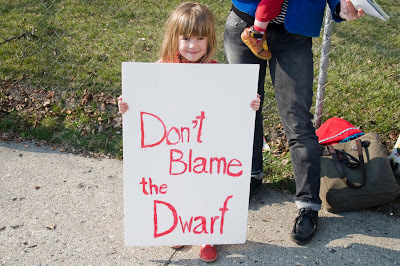 Don't Blame the Dwarf! | sweet juniper! 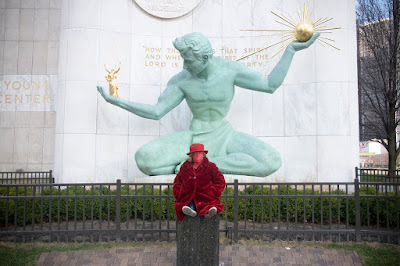 There's an old legend around these parts about a red dwarf who is seen before or during disasters that have befallen the city of Detroit. He's called the Nain Rouge, a child-sized creature in furry boots with "blazing red eyes and rotten teeth." He's sort of a cross between the Mothman and the Mobile Leprechaun. When I started telling my daughter stories about the Nain Rouge he was a harbinger of doom, but frankly the kid has never really been all that into doom so I had to turn him into a nice 600-year-old Francophone imp who lives in a hole at the base of a tree behind our house, smoking a long Peterson pipe and playing a wee accordion. Soon he was riding around in a chariot pulled by four pheasants and herding rabbits away from wily foxes. Whenever I suggest that he might have something to do with the fire that burned down the city in 1805 or some other calamity, she insists he's innocent. "He's just misunderstood," she tells me, a phrase that has become sort of a catch-all defense of any monster who might ordinarily scare her. Frankenstein, vampires, zombies, hobgoblins, mummies: they're all just "misunderstood." I sense a bleeding-heart liberal in the works here, folks. 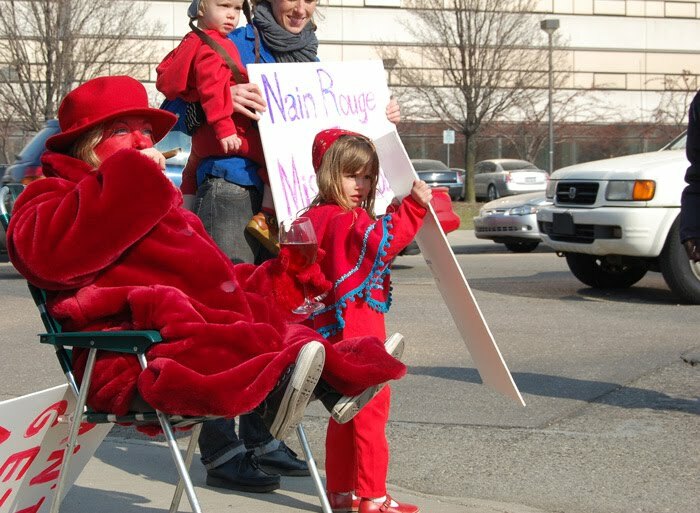 Last weekend some 200 local goofballs and hooligans participated in a march to drive the Nain Rouge from the city. There was the promise of a marching band, costumes, dogs, and a good old-fashioned effigy burning. When I told the kid about La Marche du Nain Rouge, she insisted that we not participate in any banishment parade. In this household, we are pretty serious about not crossing the wee folk. Also, I feel fairly strongly that when you're a city hemorrhaging population as quickly as Detroit, you shouldn't be exiling anyone (even impish doom harbingers). So we decided it was the perfect occasion for a protest and busted out the placards. On Saturday, some friends stopped by our house and stumbled upon our preparations. One of these friends happens to be really, really short and a really, really good sport and when she heard about our counter-demonstration in defense of the red dwarf, they headed straight for the thrift store to get a red outfit for her to wear during the parade. They even went to the craft store to get red face paint and extra placards. At some point she was worried she might make the marchers actually feel guilty but I was all YES, GOOD. Make them feel guilty! LONG LIVE THE RED DWARF! After we made our signs, I wasted no time writing up some literature [link goes to PDF of our flier] to hand out. I had way too much fun writing that (it's not often that I get to write in the slang of a turn-of-the-nineteenth-century foppish dandy). I spent more time trying to ligature that text than writing it. 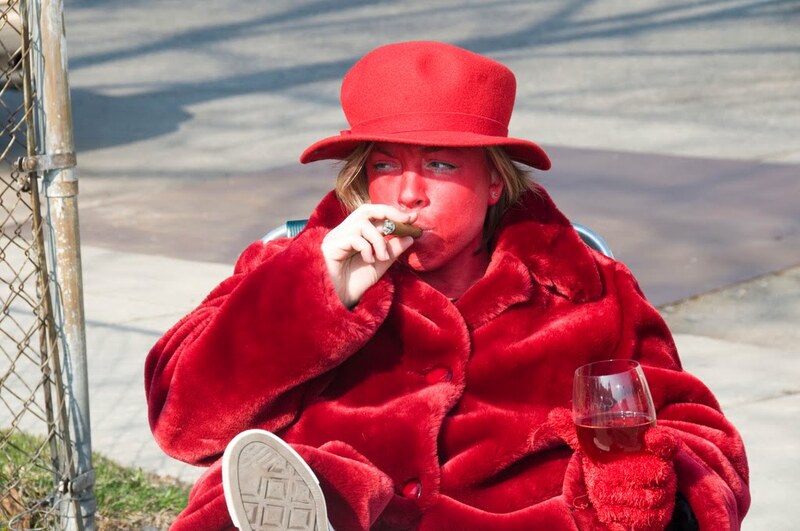 The Friends of the Nain Rouge met up along the parade route and prepared some chants and our lovely Nain Rouge practiced glowering while smoking a cigar and drinking from a chalice filled with a fine wine made from the blood of early French voyageurs. The kid decided that the marching band and the people in the costumes were terrifying and hid behind her sign. I was left to shout "Don't blame the dwarf!" all by myself. Pathetic. I was all, "You guys! We have to stay in character!" and they were all, Um, we don't really know that man. 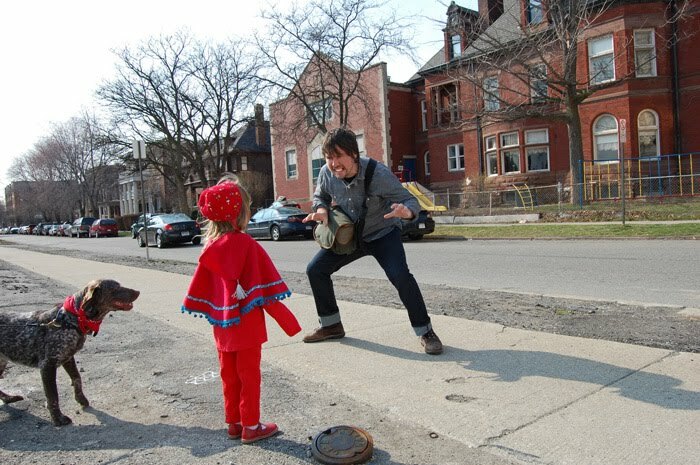 After the parade passed us we realized we still had an actual, face-painted Nain Rouge in our midst, so she drove us around to various Detroit landmarks for impromptu photo shoots. 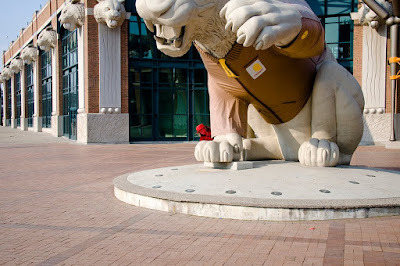 Oops, looks like it's going to be another lukewarm season for the Motor City Kitties (that's what you get for putting Curtis Granderson in pinstripes, you assholes). 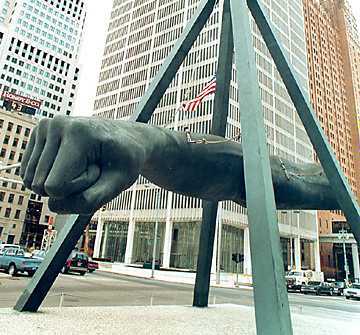 After that shot with the Spirit of Detroit statue we were planning to do a shot with the Nain Rouge fist-bumping the Joe Louis Fist, but suddenly this weird voice came out of a hidden loudspeaker ordering her off the podium. 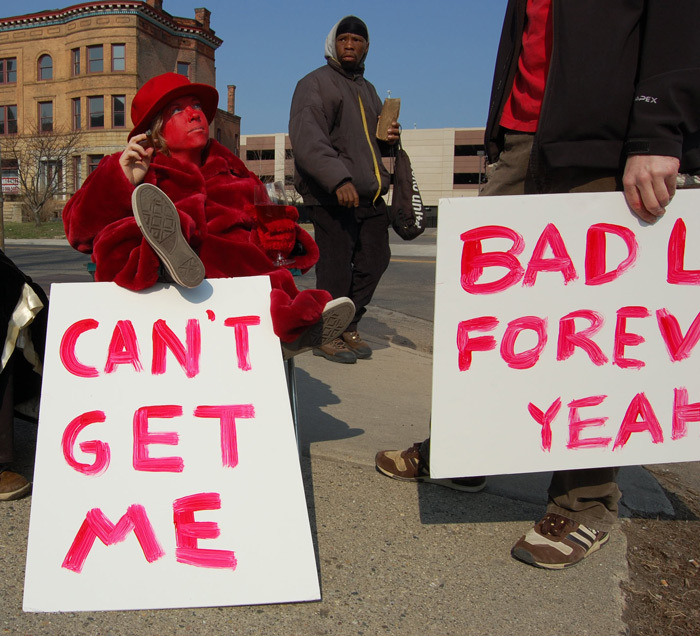 Nain Rouge, please step away from the Spirit of Detroit. We were being watched! 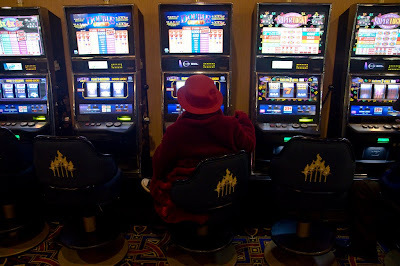 Was it the ghost of Antoine Laumet de La Mothe, sieur de Cadillac? We hightailed it out of there and decided that if the Nain Rouge really were to appear in contemporary Detroit, it would probably be at a casino. 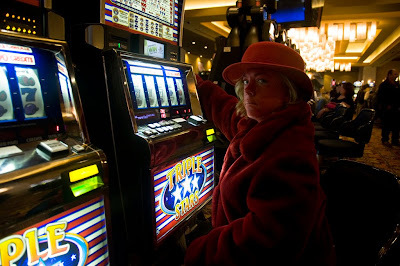 The Nain Rouge lost about $7.00, but her appearance foretold gloom and doom for at least 600 people chain smoking menthols and staring at her while losing nickel after nickel in the glow of a thousand jabbering slot machines.